Logic modules allow machines to operate without human intervention. Unlike conventional switches, they are programmable controllers which can record certain functions in their memory modules. Because of their clever functionality and flexibility they are used for both industrial and commercial applications. How do logic modules work? Logic modules have an internal backup memories that record switching functions and programs to be copied into smart relays. There are different logic modules for a variety of diverse functions. 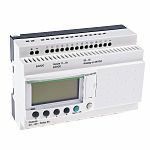 Logic modules can be programmed directly on the device using the buttons on the front of the relay, or, for more complicated processes, through the software included. What are logic modules used for? Logic modules are mainly used for complex processes where a variety of automations are needed. There are more basic versions available for less complicated operations, such as controlling windows. The intelligent features in logic modules make them integral to a wide range of applications in automotive, industrial, building, environmental, maritime and light and show technologies.